This is an experiment for me - a 16 page booklet of instructions as a downloadable pdf. If you just want the pattern, it's here. I don't have a photo of the final project because my camera is borked; I'll post photos as soon as I can. You can see the first draft of it here, it's basically the same with the proportions fixed. If it goes over well this is how I'll be giving out instructions from now on. I think I've covered just about every question people commonly ask about putting together one of my patterns, from how to stitch to the Creative Commons attribution (aka can I sell a plush made from this pattern?). If someone asks a question that's already covered here I'm not gonna answer it, cause if you can't be arsed to read it you're probably not going to have much luck making the pattern! So I started using this booklet and pattern for a project. If you want, I can post pictures of what I have so far and will definitely share the finished product. Since you posted this years ago, have you updated the pattern since or found any common problems? Right now, I'm on the step where you connect the crown to the two sides of the face and it may be how I enlarged the pattern, but the faces and muzzle don't seem to match up. 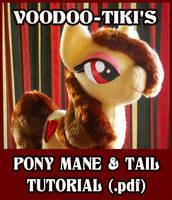 This is like, the best and most informative tutorial I have ever read. I wanna make a wolf now. Wow! Now I want to try this! Thank you! Oh my gosh !!! Thank you !!! I really want to try it !!! Thank you so much, do you have any pictures from people whom have made it? Hey, just wanted to let you know I modified and used your pattern for my Emerald Carbuncle plushie. Thanks soooooo much for these awesome instructions and pattern. I know this was a long time ago but i have been desperately trying to find a carbuncle pattern. Any chace it is for share?? I'd love to see it when you finish! Hmmm, what kind of thread are you using? I hand sew everything, too. Sorry late reply. But I finally did it i just double sewed everything. But my plush looks weird he looks kinda like a horse. His head was far to small for some reason. Your practice one looked so perfect and mine looks horrible. These instructions are great! I'm new, so the thoroughness is wonderful! This is nothing short of awesome. The instructions are so precise, the end result is really beautiful. This is a work of art. Seriously, why don't you sell these? I'm not sure what the question is, actually. Do you mean how do you download the pdf? ACTUALLY, NO. YOU ARE A GIFT FROM ALL THE GODS KNOWN TO MANKIND. This is a great tutorial and pattern. Im so excited to try this out! 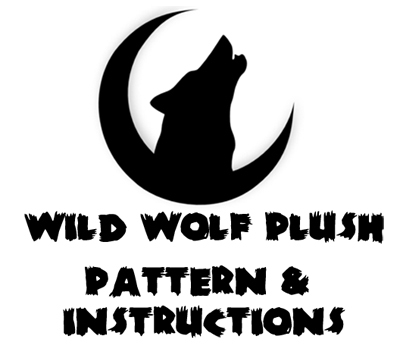 I have a friend who LOVES wolves, and I've been wanting to make her a wolf plushie for her birthday. Nonsense, there's no such thing as too many plushes. I used to dabble in sewing. maybe I will give this a try. 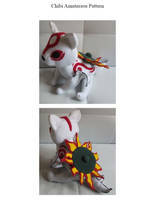 home made wolf plushie sounds really cool. do you have any pictures of a finished product?